Hartford House has been an incredible training ground for me. Here I have had the opportunity to achieve many goals and for this I am sincerely grateful to Mick and Cheryl Goss who took on a naïve fledgling and gave her wings. Tomato soup with coconut sorbet, one of the first soups I created all those years ago, is still a firm favourite. Tomatoes have natural acidity and I have never understood the reason for adding sugar. We compliment this sharpness by adding sorbet; comprising coconut milk, desiccated coconut - which adds a slight texture - and Malibu rum that leaves the final taste on your palate. The acidity with the sweetness and the hot with the cold make this a truly unusual dish. It’s a winner when you need to impress. Zandile Mchunu, my chef in charge of lunch prep and all deboning in the kitchen, has made this recipe many times over the years and she knows to always allow for an extra helping for me. Zandile and I cooked in Shanghai at the World Trade Show in 2010. It was in celebration of all things South African and was a particularly memorable experience. Now for something sweet, I suggest chocolate fondant. Although this recipe has changed over the years the dish has never left my lunch menu. I believe there would be a riot if I removed it because guests return to the Hartford House restaurant specifically for this dessert. Nonthlatha Dladla who was part of my first team at the hotel has recently returned and is doing a wonderful job on the pastry side. She and I cooked at a fantastic celebration marking the first 10 years of the 'new' South Africa in Bern, Switzerland in 2004. She has gotten into many people's good books, hearts and bellies by handing out left-over fondants with large dollops of Ultra-Mel ice cream. Zinhle Majola has worked in every department of the kitchen and knows it all as well as the back of her hand. A true team player, she puts her head down and gets the job done. Zinhle's favourite treat is our muesli chews. Florence Zuma, the newest addition to our kitchen team progressed from the scullery. With great flair she is taking control of the breakfast section, and the blueberry crumpets are high up on her list. One would expect her to tire of them because she makes them every day. Not Flo - she truly has a soft spot for these particular crumpets. Elaine Boshoff, my left and right hand who has been by my side for the last five years, has recently found an obsession for a very simple fridge tart. We recently cooked for 450 guests at Summerhill Stud's Stallion Day, which is on the Sunday after the July Handicap, a highlight on many horse-racing enthusiasts' calendars. This year, in particular, was a true demonstration of the Hartford House team effort. I left that function feeling truly blessed to have worked with so many very special people for so many years. While leaving feeling this way I think Elaine and I also felt a lot heavier as well... The fridge tart, made by the newest addition to the team Themalethu Zuma, became a huge issue for us because it was so delicious that we couldn't stop eating it. We ended up giving leftovers to anyone who walked by just to get it out of the kitchen! Travis Finch, who will be taking over from me when I leave, has a penchant for our health bread recipe. I often see him making up a well-deserved sandwich to fill the between-meals gap. It has been very rewarding to watch his growth and development over the last few months and especially now when he is soon to be taking the reigns. Future guests to Hartford House are in for a real treat. He has some delectable delights up his sleeve. Here's to some very exciting times for the new team at Hartford House and for me too. It can be difficult to get one's mind around change but change is rewarding, and always for the better. A sincere 'ngiyabonga' to the entire Hartford House team for understanding all that I wanted to achieve, and for allowing us all to grow together. I will miss you and I look forward to keeping in touch with your progress. Visit www.jackiecameron.co.za to find out more about my WOMEN'S chef range-Men's to come shortly, JACKIE CAMERON COOKS AT HOME and all my foodie adventures. I always look forward to hearing from you. 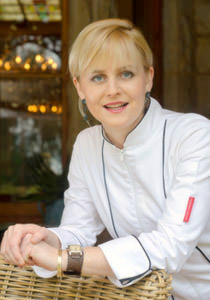 Jackie Cameron soon owner of Jackie Cameron School of Food and Wine situated in Hilton, KZN-email for enquires. For the latest on local foodie news add me as a friend on FACEBOOK. Find me on Twitter - @jackie_cameron and INSTAGRAM: jackiecameronincolour.